Los Angeles has launched a new program to clear trash from streets and neighborhoods, but the elected official who sponsored the plan admits it's not enough to solve the city's growing garbage problem. Councilman Gil Cedillo, District 1, championed a new $5 million plan, approved in October, aimed at cleaning up the piles of trash dumped on sidewalks and in alleys across the city. The NBC4 I-Team has learned the program is funding just one 13-man crew, tasked with picking up garbage throughout the nearly 500-square-mile city. Be first to see Randy Mac's next investigation. A contractor accused of leaving a homeowner high and dry. Randy exposes a renovation nightmare, and shows YOU how to protect yourself. Tonight at 6 on NBC4. NBC4 asked Cedillo: "Five million dollars is just not going to clean up Los Angeles. It's just a drop in the bucket. What are you going to say to those people?" "You're right. It's not going to solve the problem," Cedillo said. "It's the start of the solution." North Hollywood resident David Aswad has seen the trash accumulating in his neighborhood of 30 years — but has yet to see any sign of the new cleanup crew. "I don't like to walk through this," Aswad said, as they strolled down Roscoe Boulevard, which was littered with car parts and an old mattress. "I don't think most people would. It's a quality-of-life issue. It's just an eyesore." It's more than an "eyesore," according to a interior report recently commissioned by the City Administrator's office. The study found that only 35 percent of LA's streets are cleaned regularly. It noted that the "constant state of uncleanliness" is "threatening LA's image," making some areas appear "safe and ungoverned." 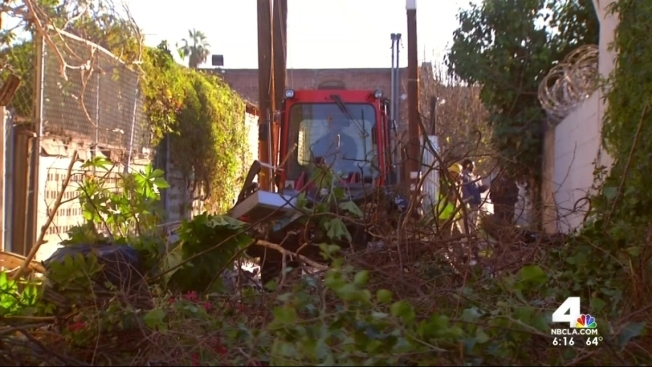 The I-Team rode along with the new trash crew as they tackled a garbage-filled alley in South Los Angeles. Supervisor Russell Zamora said the amount they have to pick up is daunting. "On a daily basis, somewhere from 30 to 40 tons a day," Zamora said. "To get the whole city done, we'd probably have to do a crew ... at all the district yards on a daily basis." Cedillo agreed much more needs to be done. "I'm pleased, but I'm not pleased enough," he said. "We got to keep going back and doing it." Back in North Hollywood, David Aswad wonders if anything will work. He asked the city to post a "No Dumping" sign, but was told it would do no good. "The city official (didn't) seem to care too much about it. The perpetrators don't care what they do with their garbage," Aswad said. "I don't know what the answer is. I'd just like to see something done." Residents who want to report illegal trash dumping in their neighborhood or find out how to get it picked up can submit an online request here or call 800-773-2489. Other information can be found by dialing 311.